Pair of Mid-Century Modern style armchairs in yellow velvet. 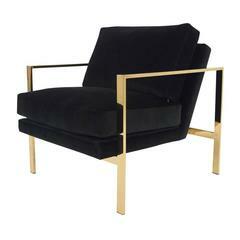 Pair of French wooden black velvet chairs, 1960s. Pair of Mid-Century Modern style Pouf, Lounge chair, round ottoman, with grey fabric. Two sets of two are available. Pair of late 19th century English Arts & Crafts armchairs with black painted frame and original rush seats. The chairs remain fragile and are decorative. Not meant for every day use. Mid century Curtis Jere Style Shoal Of Fish, hanging metal wall sculpture. 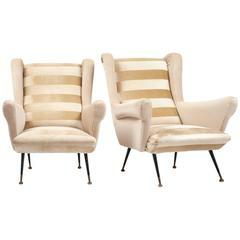 Pair of elegant Italian armchairs from circa 1950. Structure and legs in wood, newly upholstered in two different grey velvet fabrics. Excellent condition.